The rear gate faces northeast. Its splendid arch prompted Commodore Perry to compare it to an elaborate ancient Egyptian architecture. 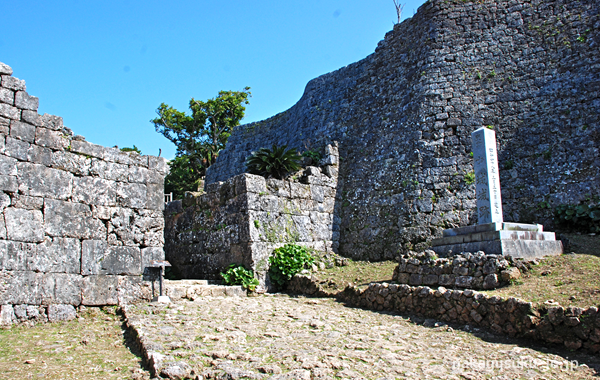 It is said to have been constructed by Lord Gosamaru in order to surround the Ufugaa well. It can be found inside the north enclosure. 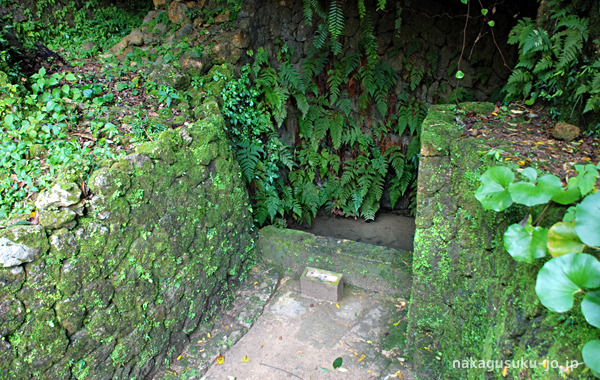 Two other wells called “Miituugaa” (Married couple wells) can be found in the west enclosure. 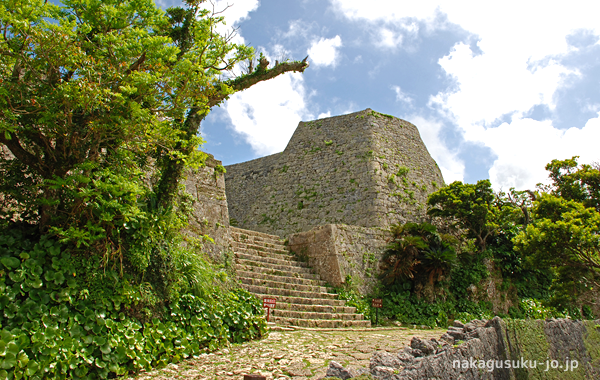 The availability of water within the castle walls is a very specific feature of Nakagusuku Castle. 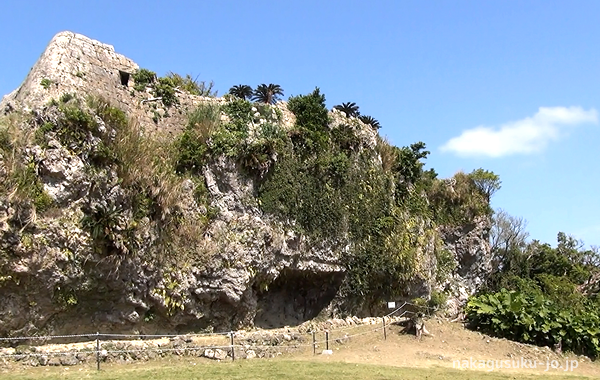 It is also called “Miigusuku” (New Castle) as it was added later. The stone architecture shown here is the most advanced. 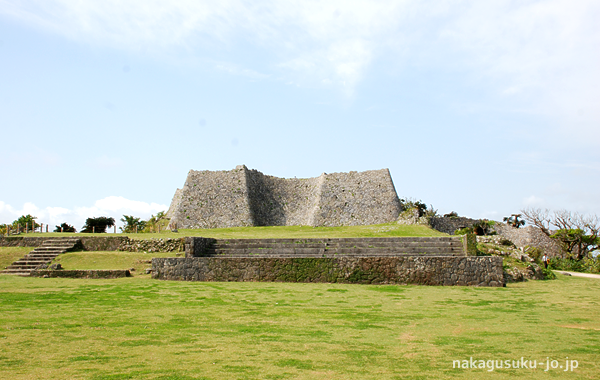 It is called “Aikatazumi” or “Turtleback” as it made of curvilinear shapes. 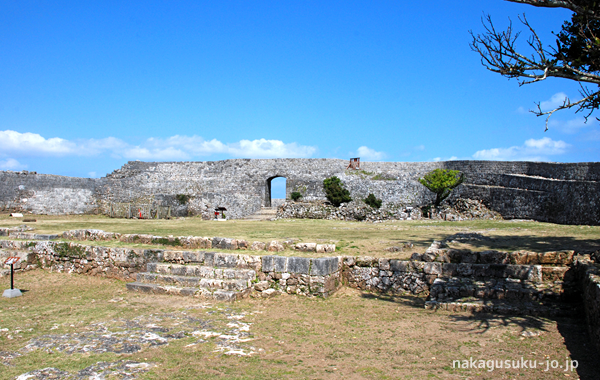 This part of the castle is said to be used for the training of soldiers and horsemen. It is 120 meters long. 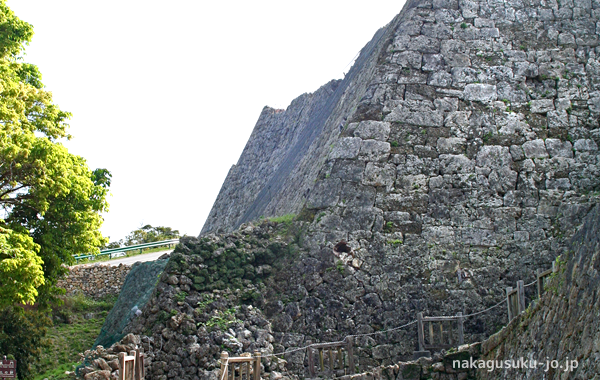 The stone laying technique used in the first and second enclosures is called “Nunozumi”. The beauty of the curvilinear shapes of the second enclosure catches one’s eye. 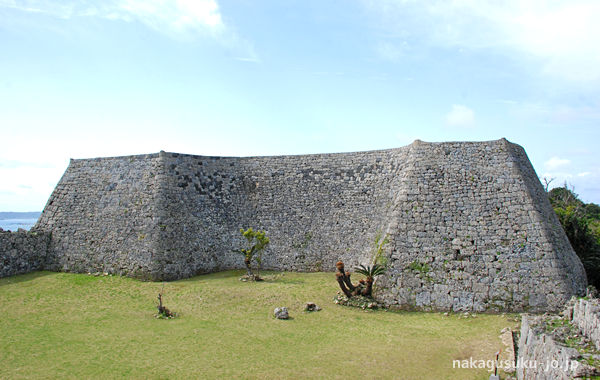 It is Nakagusuku Castle’s largest enclosure. The main hall used to be in the first enclosure. 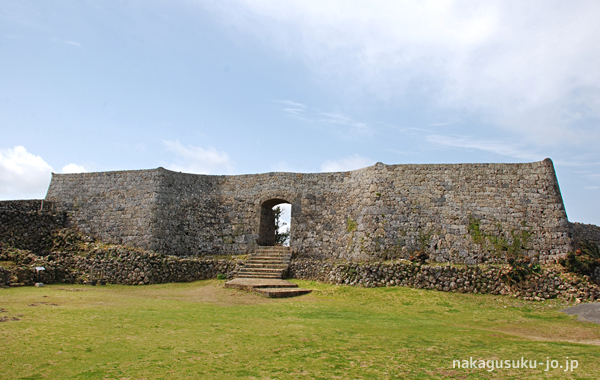 The Magiri headquarters (administrative district for the Ryukyu kingdom) was constructed later. 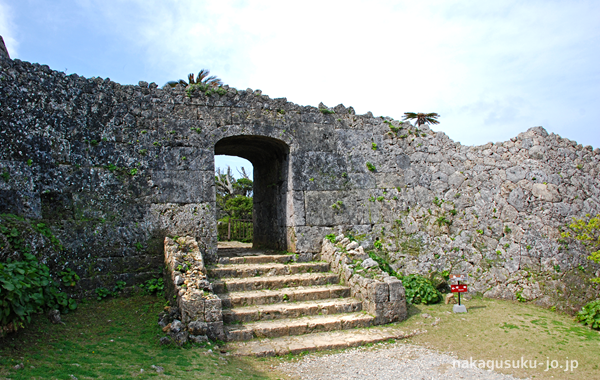 After the abolishment of principalities (han) and the creation of prefectures (ken), Nakagusuku Village’s office was established here, but was destroyed during the Okinawa Battle. 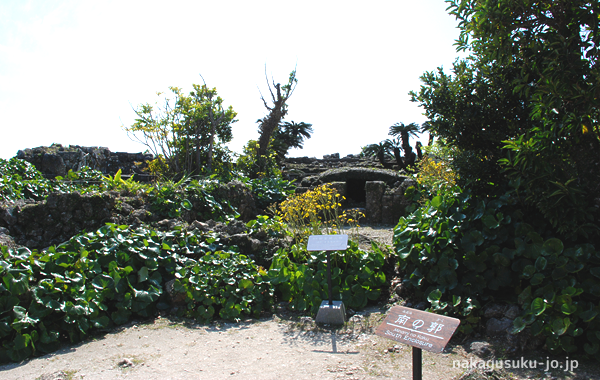 The Shuri Utuushi (Shuri worship area) can be found in this enclosure as well as the Kudaka Utuushi (Kudaka worship area). There are 8 sacred places of prayer in this part of the castle. A very interesting note about this enclosure is that people still use this area to worship to this day. The main gate (the “Yagura” gate - tower gate) faces southwest. There is a narrow passageway with stonewalls on both sides. There is also a part of the barricade that has been removed near the main gate. This is due to the Japanese army who, during World War II, tried to build an air-raid shelter but was forced to abandon it because of the solidity of the stonewalls. Ironworks were practiced here but we do not know if it was for the castle or for the village. One theory is that it was used to make weapons for Lord Gosamaru, who was preparing for an eventual attack from Lord Amawari.